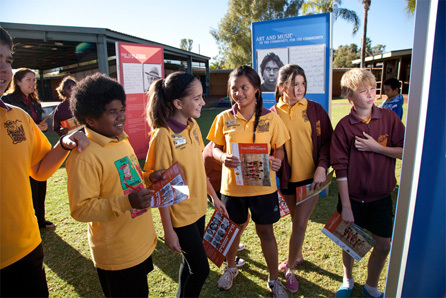 Newman was the fourth stop for Marnti warajanga’s tour of the Pilbara. The team embarked on a five-hour journey from Yandeyarra to Newman Senior High School on Monday 28 May 2012. The exhibition was set up on the lawns inside the school grounds and the team spent the first two days at this venue working with the High School students. On the third day the students from South Newman Primary School made the very short excursion next door to the Senior School to participate in the programs and experiences. The fourth day in Newman started early at 5:30am, setting up at Newman Primary School. Following a full day of workshops and activities with the students, the Primary School hosted the Community Celebration on the evening of 31 May 2012 with a BBQ, speeches and live music provided by the band The Bad Influence. The celebration was attended by the Newman community, enthusiastic to see the photographs of friends and relatives and to share their knowledge of their history.